We are proud to share the news that Dunlea Farms Pet Hay, and our Tidy Feeder hay package, have been selected as regional winners of the Premier’s Award for Agri-Food Innovation Excellence. Ontario’s local farmers are growing innovative ideas that drive our local economies and strengthen our agri-food industry. 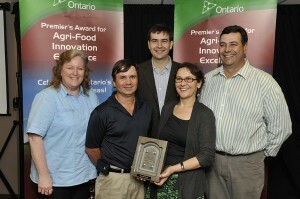 These ideas were celebrated on June 24th at a ceremony in Ancaster honouring local winners of the Premier’s Award for Agri-Food Innovation Excellence. On-farm innovations are helping Ontario farmers provide more of the healthy food that is grown, processed, and sold across the province.